Just in time for the holidays, Matt Worden (Dicey Curves, Jump Gate) brings us Santa’s Little Helpers And The Ice Cube Jam, a decidedly lighter game of tiny tiles, colored cubes, and an introduction to set collection and pick up & deliver games for youngsters and non-gamers alike. Santa’s Little Helpers and the Ice Cube Jam (ok, that’s getting abbreviated) is designed for 2-6 players and is intended to play in 30 minutes or so, though most games will not take nearly that long. In it (and I’m paraphrasing from the rules here), the players take on the role of Santa’s elves, scrambling around in search of precious cube-shaped fruits that magically appear around Santa’s workshop, so that the Jolly Old Elf can make his famous “Ice Cube Jam”. Jess: Seriously? Santa’s making jam? I love jam! Jess: WE HAVE TO HELP SANTA! To start the game, each player takes one tracking card and a pawn. Placing Santa’s workshop in the middle, the top 14 cards of the street deck are arranged to form a 3×5 grid. Aside from Santa’s workshop, each card has two sections, depicting ice, snow, or a building. Also on the cards are snowflake markers; each of these markers receives a cube, drawn at random from the bag. 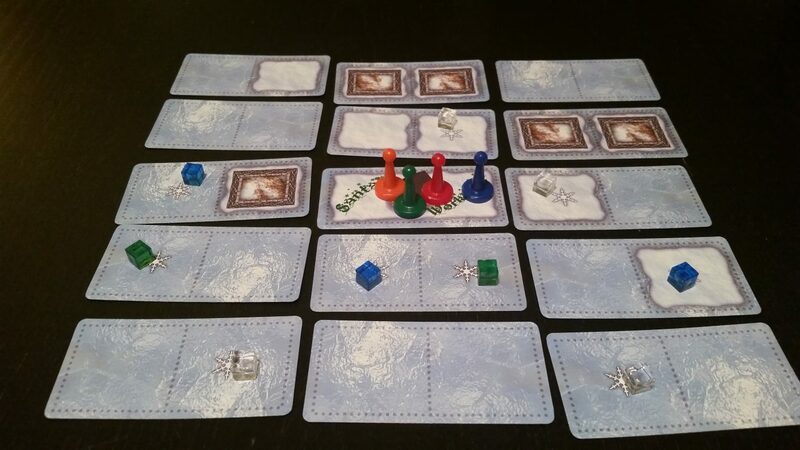 In turns, players will move around the board, snagging sets of green, blue, and clear ice, and scurrying back across the frigid terrain to the Workshop, where they will be turned in. Each turn, players have the option of adding a card to the neighborhood, introducing more streets (and potentially covering up existing ones) and adding new cubes to be snagged. Then they may also choose to take up to two movements, either advancing a single step, or optionally sliding forward as many ‘ice’ spaces as there are in a row, grabbing cubes as they go. The tiny cube-fruit all in place, the streets slick with ice, and we are ready to go. New tiles either expand the board or change up the existing terrain as they are added. Buildings and player tokens block movement, and you can only carry one set of cubes at a time, but otherwise the game is breezy and straightforward, and the first player to turn in the requisite number of sets is the winner. 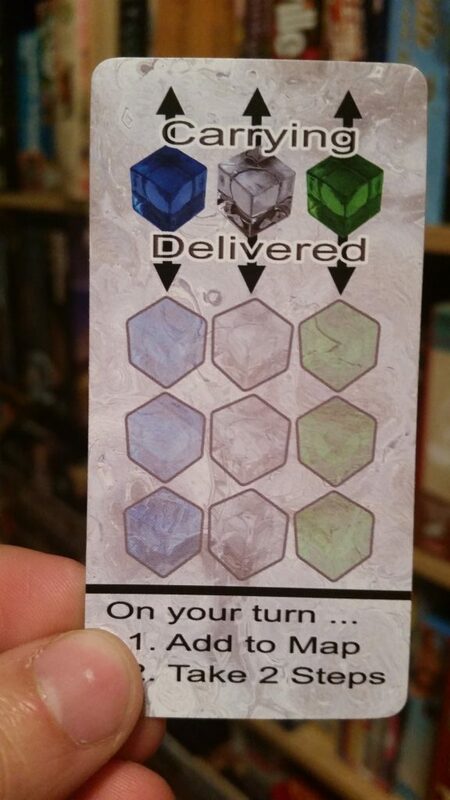 The tiny player aid cards are perfect. Jess: That seems really simple. Andrew: It is really simple. Jess: Nice! They don’t all have to be Twilight Imperium. I guess Matt Worden wanted to design a really family-friendly little game. Andrew: For sure, and he did exactly that…but stick with me for a second. There’s some stuff I think is worth mentioning. So, when we were first introduced to this game, it was immediately clear that it was a light game by design; something that a gamer could bring to a family gathering (with some kids, for sure) and still manage to get some gaming in despite being in non-gamer territory. Its small box, quick playtime, and minimal components make it a great stocking-stuffer for a youngster, and that’s certainly good enough to recommend it on its own merits. But here’s the thing; hidden inside this unassuming little box and beneath its extremely accessible gameplay are a few mechanics that are just complex enough to elevate SLH&TICJ (man, even the abbreviation needs abbreviation) above other equally light kids’ games. See, my contention is that Matt Worden couldn’t resist. I think he set out to make a cutsie little game for non-gamers and kids, but his designer instincts made him throw in a few elements that are native to more heavily-designed games. Pick up and deliver, variable terrain, strategic tile placement, multiple movement options…these aren’t necessarily the simplest gaming concepts to work with, but Ice Cube Jam (…ok, that feels about right) introduces them in a very straightforward, accessible way. Andrew: Get ’em hooked early, is what I’m saying. Santa’s Little Helpers and the Ice Cube Jam isn’t complex or challenging. It’s cute and fun and intended to be enjoyed by everyone. It might be tempting to say it isn’t a game ‘for gamers’, and maybe it’s not. But without wanting to oversell it, I think it’s fair to say that it is a game for people who aren’t gamers yet. If you’ve got stockings to stuff, you should absolutely consider snagging a copy over at The Game Crafter now! Next Post:There Are 9 Days Left to Raid The Banner Saga Warbands on Kickstarter!